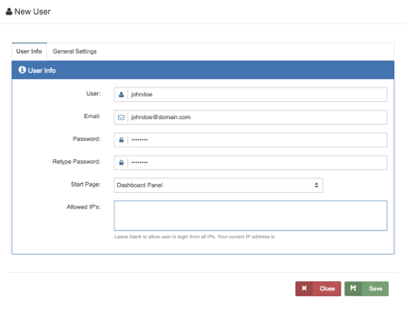 The User Manager allows admin users to add users, delete users, reset passwords, and control user permissions. To access the User Manager page, click on ‘Settings’ from the side menu bar, then select ‘Users’ from the drop down menu. 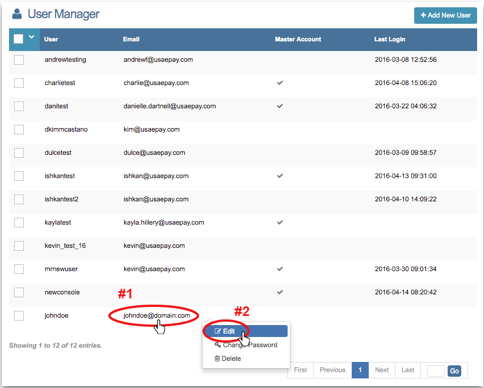 The master (primary) account of has access to all aspects of the Merchant Console including creating a new user, deleting users, assigning user rights and console permissions, and restricting IP Access. Please Note: While it is possible to have more than one Master Account, we recommend that you maintain only one and create separate accounts for other users that do not include all of the privileges of the Master Account. To create a brand new user, click located at the top right-hand side of your User Manager page. Username: The username must contain only letters, numbers, and underscores. It also must between 5 and 32 characters. Email Address: The email address of the account user. This field is optional. Password: The password must contain a minimum of 8 characters. Please Note: All users must reset their passwords every 90 days. Start page: This will be the first page the user sees when they login. Choose from the following pages on the drop down menu: New Order, Simple Charge, Refund, Open Refund, Voice Auth, Customer Database, Product Database, Batch Manager, Queued Transactions, Check Manager or Upload Manager. Allowed IP address(es): When adding a new user, you can enter specific IP addresses from which the user can access the system and conduct transactions. To allow a user to access the system from any IP address, leave the space empty. Once you have entered all the user’s information, continue to the General Settings tab. Master Account: Turning this ON grants the access to ALL settings and permissions. When this is OFF the Console Permissions tab will appear. 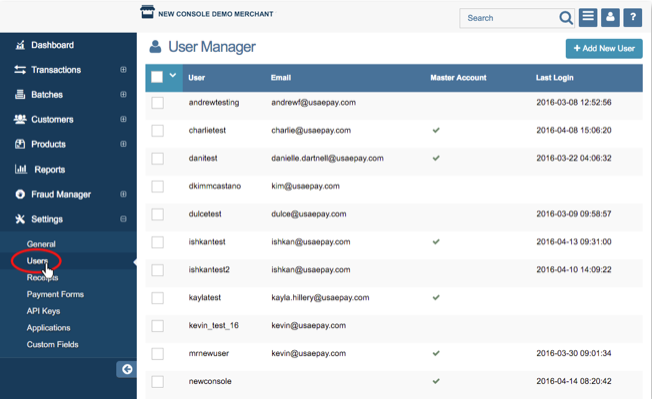 This tab will allow you to give users permission to view, manage, or use specific sections of the merchant console. Allow Password Change: Turning this ON give users permission to change their password. All users must change their passwords once every 90 days. If you do not give a user permission to change their password, they will still be able to change their password if it has expired. External Software: Turning this ON will allow the user to login to the mobile application from iOS and Android devices. 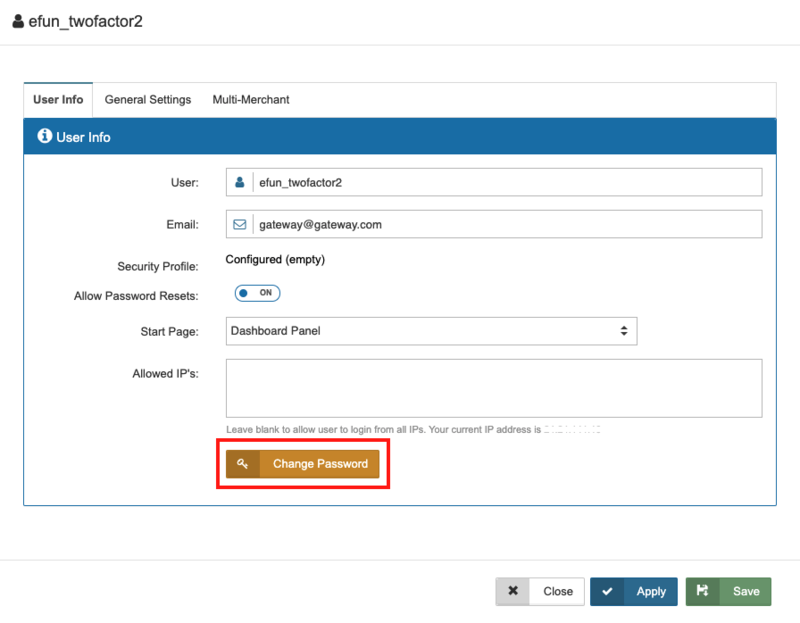 Two Factor Security This will allow you to set the default Two Factor Authentication level for a new user. After the user is created, their Two Factor settings will be exclusively managed by them in their User Settings. For further information, follow the link in the Two Factor Authentication section below. To enable a setting, switch the button to . To disable a setting, switch the button to . Click once you are done configuring the General Settings for the new user. If you have chosen to disable the ‘Master Account’ option, continue to Console Permissions. 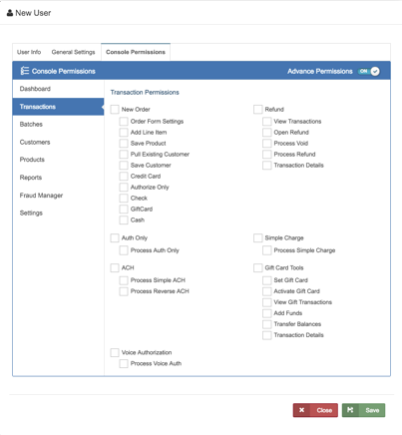 You can choose to give permissions throughout different sections of merchant console such as the Dashboard, Transactions, Batches, Customers, Products, Reports, Fraud Manager, and Settings. For example, as shown in the image below, you can choose different functions of the Transaction section. Check the function(s) you would like the user to have access to. You may also select different categories within each function by turning the Advance Permission . 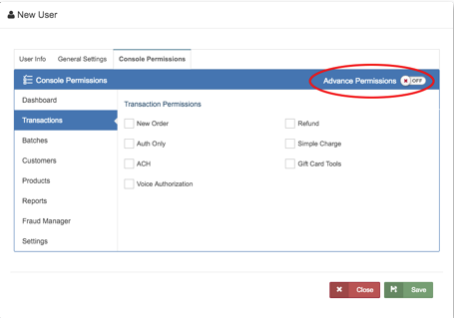 The ‘Advance Permissions’ button is located at the top right side of the Console Permissions table. Check the subcategories you want to give the user permission to use. Once you are done configuring all settings, click . You will be taken back to your User Manager page, and the new user will be in your user list. Give the user the username and password you created for them. When they login the first time the system will automatically have them reset the password to one of their choosing. Users with the correct permissions can edit a user’s information or settings using one of the following methods: By clicking on the user from the User Manager page OR By right-clicking on the user from the User Manager page, and selecting ‘Edit’. Both methods result in the same outcome. A pop up window will appear where you can edit the User’s Information, General Settings and Console Permissions by navigating to the correct tab. Click once you are done editing the user’s information and settings. 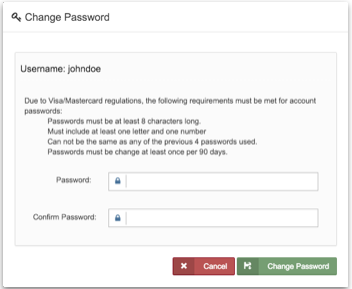 A user with a master account can change all user passwords at any time. To change a user’s password, right click on the user from your User Manager page then select ‘Change Password’. The ‘Change Password’ pop up window, as shown in the image below, will appear. Enter the user’s new password on the ‘Password’ field. Enter the new password again in the ‘Confirm Password' field. Click when you are done entering the new password. You will the be taken back to the User Manager page. From your User Manager page, right-click on the user you wish to delete then select ‘Delete’. A pop up window will appear to confirm the deletion. Click to continue. 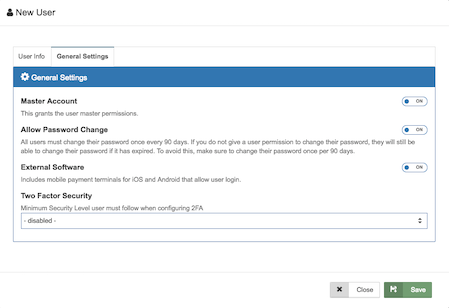 You can also set up two factor authentication for your user. For more information about how to set up two factor authentication, click here.